Yeah, it's so good with pork - especially the fatter cuts like shoulder. It's always fun to break out some jam in the middle of winter. I'll take cranberry sauce any way I can get it. :-) And that reminds me of the movie 'Shadowlands,' where Joy and her son Douglas have arrived to spend Christmas with him. Douglas wants cranberry sauce. So C.S. tells his housekeeper that they need cranberry sauce. She looks a bit flummoxed and says, 'Well, Mr. Lewis, you get me the cranberries and I'll sauce 'em.' :-) P.S. That is one of my all-time favorite movies!! Judy, I assumed from the name of your blog that you're a cranberry fan. I'm not familiar with that movie; I'll have to check it out. When I was a kid, there was only that jiggly jellied stuff on the holiday table. After I moved to AZ was when I finally had homemade cranberry sauce and I was hooked... would never go back to the canned stuff again!! Agreed! And I haven't looked at the label, but I'm sure it's made with corn syrup and HFCS. 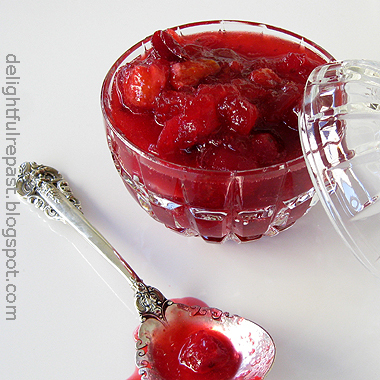 We don't always have turkey for thanksgiving but I love homemade cranberry sauce when we do. I'll have to point my wife to this recipe since she is the one who enjoys making it. I'll be dressing the turkey! Richard, cranberry sauce isn't just for turkey anymore! Great with pork, ham, lots of things. I just eat it by itself. Can never hear the word “cranberries” without thinking of the iconic band that did one of my favorite songs/music videos “Dreams.” Their original name was “The Cranberry Saw Us” – playing off “Cranberry Sauce.” And with that bit of useless information, may I say I love REAL cranberry sauce, as you’ve made it. And you’re absolutely right, it has to be chilled. Alas, if/when my lad, a.k.a. Sean/Shane/The Boy actually comes over for Thanksgiving dinner, he will only eat chicken. We call this Pseudo-Turkey. But chicken and cranberry sauce just highlight the drift from tradition, and I cannot do it… So, thank you for the vicarious reprise to that time in my life when turkey and REAL cranberry sauce added the delicate touch! When I just saw the words "cranberries" and "band," I thought I knew where it was going. But I didn't. I was thinking of The Traveling Wilburys! (My mind just sort of goes places ... what can I say?) About the lad: Haven't you told him turkey tastes like chicken? I make it several times a year - don't need a holiday! Good one Jean. We have it with pork and it is always part of our Christmas dinner, alongside horseradish.Some English mustard goes down well too. One of my favourite sauces, though, is parsley sauce. We tend to have it with a nice piece of bacon on Boxing Day. Thanks, Tony. I haven't had parsley sauce since childhood, and it had fallen completely out of my memory! Must make some soon. Fresh cranberries are quite pricy over here..and I don't even know where to get the frozen one. The sauce looks divine, Jean. Thanks, Angie. Maybe you could ask a store manager to order some for you? Ok, I'm assuming you make this with fresh cranberries - which we can't get - do you think dried would work? Hi Carole - thanks! Yes, this is made with fresh (or frozen) cranberries. You can make a sauce with dried cranberries, but not this particular recipe. Perhaps the same ingredients, but a smaller measure of dried cranberries and a longer cooking time? 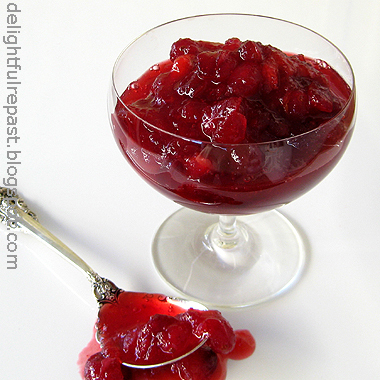 Definitely cranberry sauce made at home! I have a huge bag of cranberries ready for the task! Colette, yes, I'm sure *you* would make homemade in order to avoid all the funny additives. Yikes! Urgh! I hate that jelly cranberry sauce stuff, my family always has it at Christmas and its horrid in my opinion. We spend all that time cooking up a beautiful home roast lunch, and then smear sugar jello rubbish on it. THIS is what real cranberry sauce should be like. Thanks, Hamilton! And please let me know how it goes over with your family! Well, surely the Swedish people you know would see it as a reasonable stand-in for lingonberry sauce! But French people - never thought about it, but do most of them not like it? Fantastic! I've been meaning to make my own. I much prefer the whole berry sauce to the overly thick gelatin out of the can. I need to try this with my cranberry BBQ sauce recipe! Jade, thank you -- especially for leaving a comment on an older post (sometimes people just don't!). Once you make this sauce, you'll *never* go back to the canned sauce, I'm sure! I can't stand the canned stuff. Even as a kid I didn't like it. No nostalgia there for me. I'll take homemade every time! This looks delicious, Jean! Thanks for sharing it with us at Foodie Fridays! Thanks, Michelle! Happy to help people get away from the canned with corn syrup sauce! I always make my own cranberry sauce and you and I make it almost the same way although I have never used the mace. Sounds good though. The really nice thing about your own cranberry sauce is that it makes plenty and I also use it for making Cranberry squares. Nothing better than home made, is there? Merry Christmas, Jean! Thank you, Sandi. 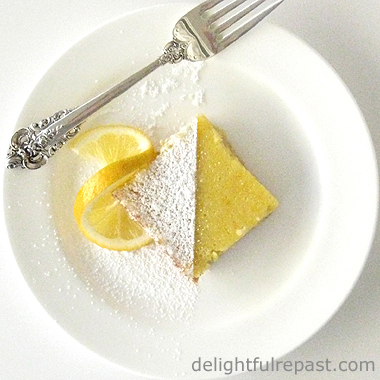 I'd be willing to stir up a batch just for those cranberry squares! I must try them soon. Hope you're having a delightful December!